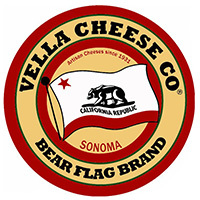 Contact Vella Cheese Company Today! At Vella Cheese Company, we have made Monterey Jack, the only cheese that originated in California, the same trusted way since 1931. We make a soft, high-moisture Monterey Jack, a Dry Monterey Jack, and also a part dry version called Mezzo Secco. Recently, Vella's Mezzo Secco has become very popular due to its flavor and versatility but we are most famous for our Dry Monterey Jack cheeses, which we offer in three different ages - Regular Dry Jack, (aged a minimum of 7 months), Special Select Dry Jack (aged a minimum of 1 year), and Golden Bear Dry Jack (aged a minimum of 2 years). Ignazio "Ig" Vella focused on expanding variety while maintaining the quality of the artisan cheeses produced. He was instrumental in developing the worldwide popularity and reputation of Vella's flagship product, Dry Monterey Jack. Our cheeses have been made the same way for 85 years, by hand with milk from a family-owned dairy just a few miles away. Quality and consistency is the key to our success. The third and fourth generations of the Vella Cheese family continue the tradition of small batch, high quality artisan cheeses. Charley Malkassian has been at Vella Cheese since 1980 and became Vella's Head Cheesemaker in the mid-1980s. He is the only cheesemaker to have worked with four generations of the Vella family and has produced, and even helped develop, some of Vella's award-winning cheeses. He has won a number of awards at Vella Cheese that go back as far as 1994 and as recent as 2003. In 1994 and 1995, Charley was awarded the Best of Class award at the Wisconsin Cheesemakers Association for our Dry Monterey Jack Cheese, and at the 1995 U.S. Championship Cheese Contest, he took home the Best in Class trophy. Charley is very modest and will not consider himself labeled as a "Champion" cheesemaker, but rather as a cheesemaker that has a great crew that love what they do and take pride in doing it. This cheese originated in the commune of Asiago in the province of Vincenza region of Il Veneto in Italy. It was originally made from sheep's milk, but it now is universally made from cow's milk. The result is a sweet curd, grana-type cheese with a pleasant aroma. Vella's Asiago may be used as a table cheese when young. Ignazio Vella proudly claimed that Vella Cheese was the first small factory to produce Asiago in California. Daisy cheddar has a uniform butter color, and a subdued aroma of cultured milk. The cheese is moist yet firm, creamy and mellow on the tongue, with that familiar cheddar tang, but without the bite. It is mild enough for a child's snack, yet compelling enough to put on a pre-dinner cheese board with some green olives and salami. Firm in texture with a pale yellow color, the cheese has a rich, nutty, yet mild and assertive flavor. As the cheese ages, Dry Jack wheels become increasingly brittle. Since the cheese is similar in texture and taste to Parmesan, it makes a good substitute for churning and grating over salads, pasta, soups or tacos. Vella's Dry Jack can be shredded, cooked, sliced, or just enjoyed as it is. Dry Jack is also perfect for grating over casseroles, toasted cheese sandwiches, omelets and soufflés. Vella's Mezzo Secco, a partially dry Monterey Jack, has a very interesting history. In California from the 1920s thru 1946, household refrigerators were not yet common. Most households only had iceboxes that were cooled by a melting block of ice. In summer weather, milk and butter were placed directly onto the ice box, and other foods, including fresh cheese, were left in the adjoining compartment, which was not as cold. Families needed a firmer fresh Jack that would not get runny, yet was not as firm as dry Monterey Jack, so Vella created Mezzo Secco, which was available from May to October. Later, when refrigeration was widely available, Vella stopped making Mezzo Secco. In 1999, Vella revived Mezzo Secco and earned a silver medal in the U.S. Cheese Championships. Aged a minimum of four to seven months, Mezzo Secco is a delicious complement to Vella's line of Dry Monterey Jacks, and continues to earn national and international recognition. Vella's Monterey Jack is the most rich and delicious Monterey Jack anywhere. Its rich, buttery, creamy texture and taste leaves a clean fresh flavor in your mouth. At room temperature, it's as soft and creamy as a fine Brie, but far more economical. The imprint of the muslin cloth on the back of the wheel shows that it has been rolled and shaped by hand. No machine-made cheese could ever match this level of character and individuality. Vella's High Moisture Monterey Jack is available in both blocks and wheels. Block Jack is firmer so it slices and shreds easily. It is great for everyday use. Wheel Jack is softer and creamier, so it is great for a cheese plate.